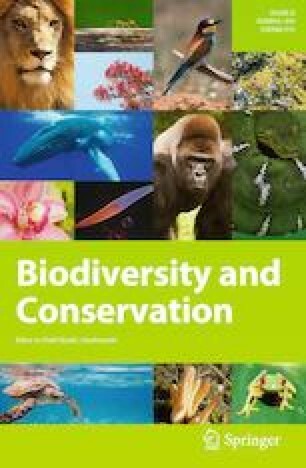 Deforestation is a major driver of biodiversity loss in the Tropical region, but the role of upstream refugia and dispersal ability on the community response to this disturbance is unknown. We assessed the relevance of undisturbed upstream patches (“refugia”) on the responses of benthic communities to forest cover loss. We selected four Andean rivers with a well-protected forest in their upstream section and different degree of forest cover loss downstream and evaluated the dissimilarity patterns of three benthic communities (diatoms, Chironomidae, and the assemblage of Ephemeroptera, Plecoptera and Trichoptera—‘EPT’) along their water courses. We evaluated the dissimilarity by using Euclidean (environment), Sørensen (incidence data) and Morisita–Horn (abundance data) pairwise distances. We found that diatom beta-diversity, as organisms with passive but higher dispersal ability, significantly tracked the environmental changes caused by forest loss. However, insect communities, whose a priori are active dispersers and can track for suitable conditions, were weakly affected by deforestation. These results provide evidences that the existence of well-preserved upstream reaches along patched corridors may allow non-tolerant species to remain extant throughout dispersal-driven feedbacks. This being the case in the Andean streams, effects of deforestation on benthic communities were small, and not uniform. Our results reinforce the strategy of preserving upstream sections in order to achieve successful restoration or rehabilitation goals. The online version of this article ( https://doi.org/10.1007/s10531-019-01739-2) contains supplementary material, which is available to authorized users. We would like to thank to the two anonymous reviewers who help to improve substantially our manuscript. We are grateful to Liz Alonso, Katherine Pallares, Laura Fernández and Daniel Amézquita for their help in the field and the laboratory. Special thanks to ‘La Chorrera’ Natural Park for providing access to ‘Chiflón’ stream, and to Miguel Rodriguez and his family for hosting us during our field work. The surveys were financed by the Universidad Nacional de Colombia—Sede Bogotá, through DIB project no. 34856 (CONVOCATORIA NACIONAL DE PROYECTOS PARA EL FORTALECIMIENTO DE LA INVESTIGACIÓN, CREACIÓN E INNOVACIÓN DE LA UNIVERSIDAD NACIONAL DE COLOMBIA 2016–2018).